« What’s New in Arcadia? 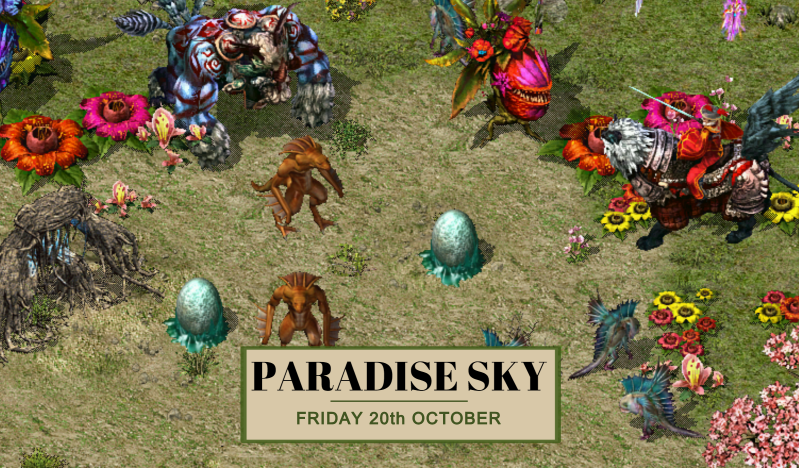 Based on the hugely successful Skies of Arcadia event hosted last year, we have created two brand new hunting grounds – Paradise Sky. Head over to Arcadia and teleport into the heavens for a truly exciting experience in Paradise Isles or Paradise Lakes. Go head-to-head with a Timber Thorn and unearth new equipment, or take a team to defeat the Sky Knight for a chance to discover new skills and spells. Watch out for the dance of Four Tails, for his rage will make the ground tremble, and send you running back to town..
has a new horde of Kings Guard aimed at level 140+. The old monsters have taken up refuge in Desolate Chamber with their Queen. This new area is boss-free, and is a safe-zone throughout. The Butcher of Old Tomb has rallied forces with his brothers in Naga Ruins. The higher concentration of monsters makes for a more challenging dungeon. is now empty as Ground Mover has relocated to another dungeon. Can you find him??? ✓ New set of “super rares” added!